A new hearable will offer a new level of information to help you run faster, cycle harder and generally be fitter – if it lives up to the promises of its CES launch. BodyTrak is a wireless, in-ear device that can monitor not only heart rate and fitness, but also core body temperature, allowing you to work out more effectively than ever. Created by Inova Design in the UK, BodyTrak is touted as the "first and only in-ear body monitoring platform to accurately measure multiple vital signs", and promises to offer performance gains from the professional sportsperson to the hobbyist athlete. Core body temperature could become another key measurement as more fitness enthusiasts look to understand they way they're performing during training and events – as humans progress towards higher internal temperatures, the body can reach a point where it will limit performance to prevent damage. By understanding your own body temperature during exercise, it's possible to train yourself to function more effectively in these periods and thus perform at a higher level. Previously the best way to gain access to body temperature was through an internal pill (or a rectal sensor... but nobody wants that) but by using the ear, BodyTrak claims it can pull the data accurately along with other metrics. The big question here is: will having all these metrics from one device really help? 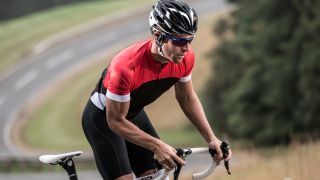 There's no doubt that BodyTrak is getting some big names on board, with organisations from Premier League football teams to the UK's Ministry of Defence trialling the product, but it's hard to know how effective the hobbyist fitness fan might find it. The ear has been proven as a better place to gain heart rate data from, thanks to the closer proximity to a major organ and thinner skin to offer better pulse readings - brands from Samsung to Jabra to Moov have all released heart rate monitors designed to be worn on the head. However, putting all these sensors in one place means packing them in tightly, and with Bluetooth communication and music playback also offered, there are a lot of components competing for that limited ear space. The BodyTrak system uses the accelerometer for pace and distance, although can connect to a phone or running watch to gain information via GPS instead. There's also the question of how to interpret that data - how will the user be able to decode the information presented? If BodyTrak offers a training program alongside, having that body temperature information could provide a real training edge. Without it and you'll need the ability to interpret such data to make it worth the cost - and given we've not heard the BodyTrak price yet, that could be an expensive punt. If you are interested in packing all these sensors into one easy-to-reach place, then the BodyTrak release date has been set for summer 2017 for the UK, with US and Australia releases being mulled for the future - we'll bring you more information when we find out the price and actual launch date (as well as hopefully trying it out for ourselves).